Sometimes I’m excited to post here because I have a great recipe to write about. Sometimes I’m excited because I have a great character to introduce you to. On the best days, like today, I have both. Technically, my friend Victoria Granof is a food stylist — someone who makes the meatballs or the soup look appetizing for the camera — but to define her that narrowly would be a tragedy. Where do I even begin with her? If I showed you her Official Resume, you’d probably just be intimidated. Trained at Le Cordon Bleu in Paris, Victoria collaborated with the legendary photographer Irving Penn at Vogue and beyond. She’s been behind some of the more iconic food images in both recent history (New York magazine’s cover girl cow, anyone?) and at my dinner table (hello, dreamy little lettuce hand rolls). Chances are, you’ve cooked something in your kitchen because she was the genius who made it look so freaking delicious in the photo. Of this I’m sure. But that doesn’t really say what I want to say about her. A dollar bill is exactly six inches long if you ever need a ruler; 1/2 ounce equals a tablespoon; you can use heated dried beans for a heat compress if you don’t have an actual heat compress; pound cake is called pound cake because way back when it called for a pound of butter, a pound of flour, and a pound of sugar; a nonstick skillet is the way to go for meatballs; stir latke mix with a silver spoon to prevent the potatoes from graying, Zocdoc is the way to go for organizing doctor’s appointments; an origami-envelope is the way to go for mailing cash…And (perhaps my favorite) Don’t bother with a from-scratch cake for your kid’s classroom party, just frost a store-bought pound cake, cover it with assorted candies, all in the same color (key), and watch the kids lose their minds. What makes her so good, of course, is that she finds inspiration anywhere. On the first day of the shoot, I caught her staring at a strainer that was lying on my kitchen counter. “What?” I asked her. I’ve had this strainer for probably 20 years — so long I don’t even see it anymore — it’s all misshapen and the plastic handle has been accidentally melted at least thirteen times. She says, “I think this strainer has an amazing story.” She was, of course, right. The good news is that you can find out what I’m talking about for yourself. That’s because the smart people over at Short Stacks signed her up to contribute a book in their single-ingredient series, and it’s a treasure trove of Victoria-isms. For her ingredient, she chose chickpeas and allow me to stop your brain before it goes hurtling towards the hummus direction. (Le Cordon Bleu, remember?) We’re talking Roasted Salt & Vinegar Chickpeas, Red Curry Vegetable Fritters with Sweet Coconut Chutney, A baked chickpea-flour flatbread called Socca, Turkish Rice with Chickpeas and Cinnamon, and, Pasta Con Ceci, which is her 11-year-old’s favorite, and now my 12-year-old’s favorite. It’s up there in the photo and it’s just about the easiest thing in the world to put together for a fast dinner. Look! This is all you need! Victoria was nice enough to let me share the recipe with you guys, so here it is. The introduction is in her words. In a large heavy-bottomed pot, heat the olive oil until it shimmers. Add the garlic and cook, stirring until it becomes lightly browned and fragrant. Stir in the tomato paste and salt and fry for 30 seconds or so. Add the chickpeas, pasta, and boiling water. Stir to scrape up any browned bits on the bottom of the pot, lower the heat, and simmer until the pasta is cooked and most of the liquid has been absorbed, about 15 to 20 minutes. To serve, ladle the pasta into shallow bowls, sprinkle with crushed red pepper flakes, and drizzle a bit of extra-virgin olive oil on top. 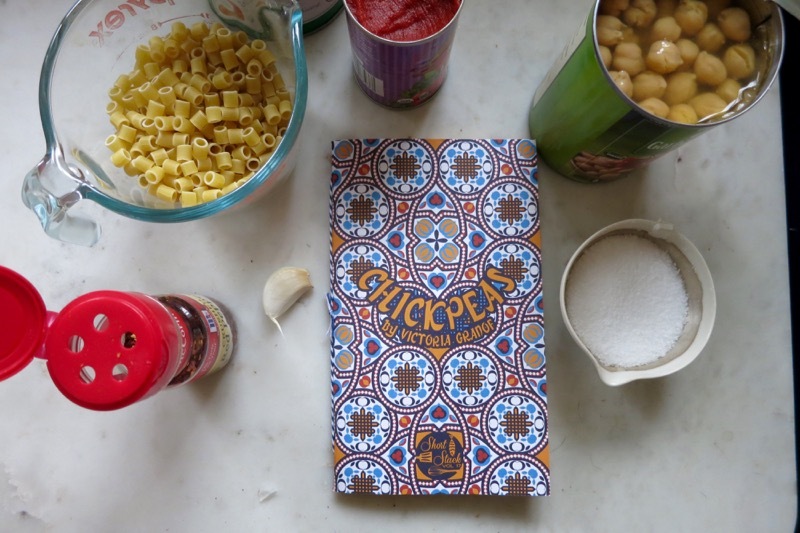 Chickpeas, by Victoria Granof. On sale over at Short Stacks. That was an incredible tribute. Mrs. Ward, you are a jewel, and a treasure for a friend. I am not worthy. (well yes I am). Did I really say all those things? (well yes I did). Thank you for this lovely posting. I feel like my Chickpea book and I have just been asked to sit at the popular girls’ table. p.s. I really must change the shipping address on my Etsy account so you stop receiving my vintage impulse purchases. I finally figured out who Mrs Ward is – took me a while. Oh, and the pasta sounds very nice. Victoria sounds gloriously one-of-a-kind. I can’t wait to hear about your new book, and I can’t wait to try the pasta con ceci. My favourite part about this recipe is that it’s all cooked in one pot. My second favourite part is Victoria Granof’s comment below. Love her! She made a photo shoot in the VT hills many years ago so much fun. Pasta AND chickpeas?? This is going to be a crowd favorite at my house. I can’t wait to make it. Just had this for dinner. The kids and I loved it! Such good comfort food. Chickpeas in pasta I don’t know why I haven’t tried that before. This will be dinner this week as it is cold and rainy and this will be perfect after a long day. And I love when friends get to hear lovely things we say about them as it happens far too few times in life. Thanks for sharing all the wonderful tips. Just reading this today and think it’s perfect for Meatless Monday at our house. 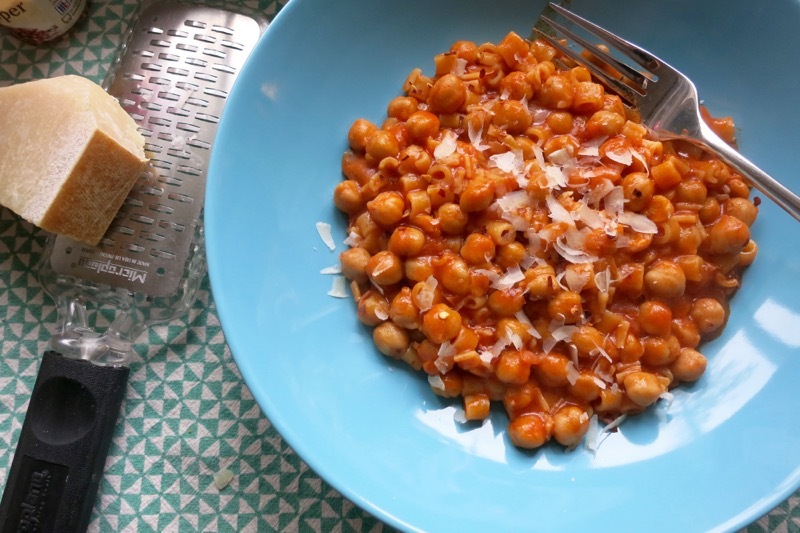 Chickpeas are usually a “no,” but I think this recipe might just change that. Made this tonight, and even with GF pasta (I have Celiac), it was amazing. Truly delicious and filling. I doubled it, and the four of us (parents plus 12 y.o and 9 y.o.) ate the ENTIRE pot. I’m always looking for vegetarian dinners that are actually satisfying, and this knocks it out of the park! Thanks! oh, wow! I doubled this recipe, too…We are a family of just 3, but i thought we might want leftovers. ha! my underweight 8 year old devoured his dish and gave it two thumbs up. high praise! my husband had 2nds. It doubles easily (may need to triple for the next time). I did hold back ever-so-slightly on the olive oil, but it still felt decadent. This is definitely going in our rotation. Thanks! Uncovered. Hope it worked out! On a whim, I added cubed, raw eggplant to the oil at the beginning, browned it; then added the garlic and proceeded. I highly recommend that twist – makes the recipe taste richer and smoother than without (I’ve tried this both ways). I tried this last night and it was amazing. I love the contrast of the the textures of the pasta and the chickpeas. It makes eating the dish a very interesting experience. Do you have to use ditalini? What if I have small whole wheat wagon wheels, will that work? This has become a staple budget meal in our house. It is so good for how simple it is that it blows me away every time. We double the recipe for the two of us, and have some leftover which reheats beautifully. The last two times I’ve used the leftover olive oil from a can of Portuguese sardines and it adds some great, subtle flavor. 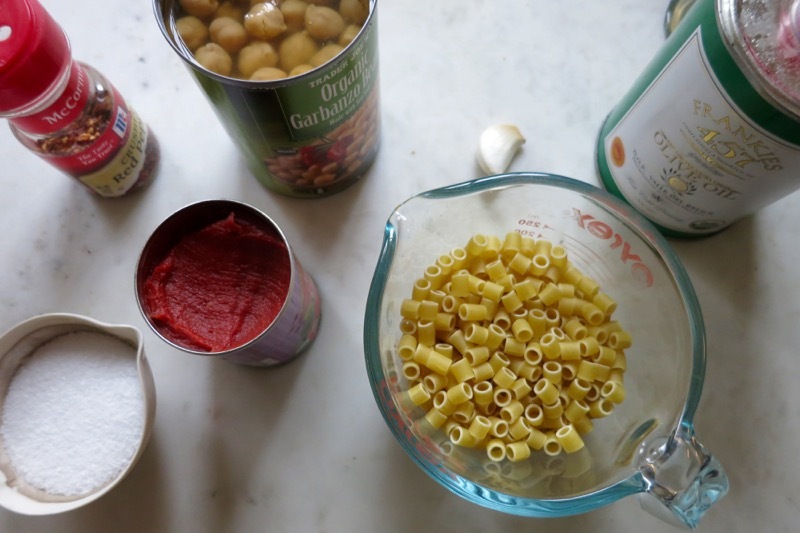 We grew up eating Pasta Ceci – my great grandmothers receipe from when she grew up in Italy. The difference is that we add salt pork when we toast up the garlic and make it more of a soup with a can of water and sauce, along with the paste and add a few tabelespoons of parsley and basil – comfort food at its best! So I’ve made this twice so far, and really like it. But it makes such a splattering mess when I add the tomato paste! Is that just how the recipe is? Is the heart on my olive oil too high? I had the same issue – it looked like a murder scene halfway through the recipe. That said, I’m totally making this again – delicious. Very delicious. Thanks for the recipe! Made this last night and like the others was amazed at the taste. For such a simple recipe it did not disappoint and I wished I had doubled the recipe as hubs, 8yr old daughter and I thought it was delicious and could have easily had another serving. Thank you! I doubled this recipe because we are four and I could not leave it alone without fresh basil and parsley. I also added fresh cracked pepper and cooked it with the red pepper flakes instead of sprinkling them on top. I just learned about Parmesan rinds too and I may cook it next time with one and I like the idea of using a canned fish olive oil for a deeper flavor! I’ll see how tonight goes over! I’m so glad I found you!! I love creativity in all forms. But when it comes to food and photography, I’m in awe. This is a terrific recipe and contrary to what some believe, a recipe doesn’t have to be complicated to be delicious. I’m looking forward to getting to know you better, I’ve signed up for your newsletter. Have a great day! !